A recent report from Pew Center on the States finds a $1.38 trillion gap between state obligations for retirement benefits and what is actually available. 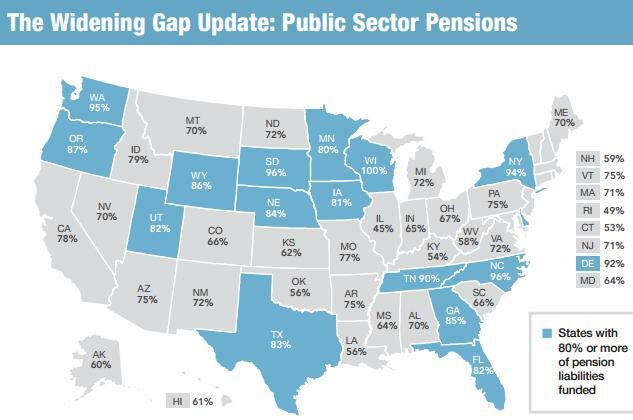 This gap is made up of pension and health care costs, and has expanded 9% since 2009 (read the full report here). The depth of the problem varies across states. Some, like Washington, has 95% of pension obligations funded, while others like Rhode Island have funded less than half. This graphic from the Pew report shows states with above 80% funding (the national average) highlighted in blue, and those below the average in gray. Source: Pew, the Widening Gap Report. Settling that $1.38 trillion gap basically guarantees either huge cutbacks in benefits or tax increases on the next generation, or some combination of both. Alternately, the Federal Government could offer a bailout, but one way or another the general public will end up paying for profligate public sector benefits. So whose fault is it? On the one hand, state policymakers shouldn't have promised more than they could reasonably deliver, and now that retirees are expecting those benefits, it will be cruel and difficult to make those promises go away. On the other hand, public sector unions shouldn't have been so greedy for benefits and set us on this unsustainable path to begin with. There is no convenient scapegoat in this case because the politicians, unions, and workers all made mistakes to some extent. Scott Walker's success in the Wisconsin recall demonstrates the public is ready for bold action to rein in the costs of public sector retirement benefits, but expect more heated political battles ahead.